As Mangara's Equity comes into play, choose black or red. At the beginning of your upkeep, sacrifice Mangara's Equity unless you pay 1W. 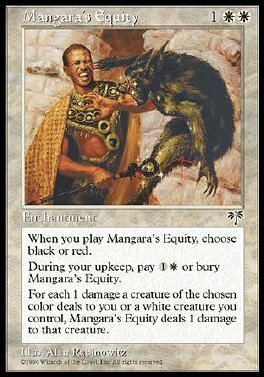 Whenever a creature of the chosen color deals damage to you or a white creature you control, Mangara's Equity deals X damage to that creature, where X is equal to the damage dealt to you or the white creature.